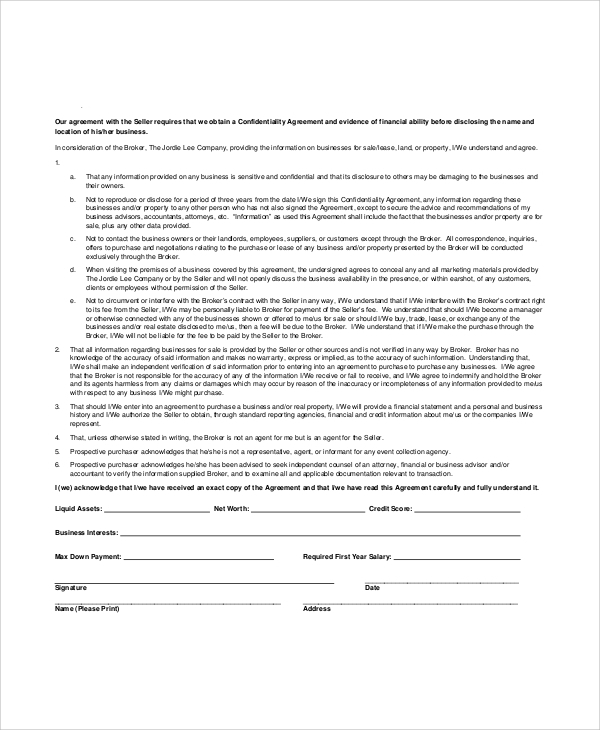 For any company who want to start a new business or sell it to the other party, you must have a business purchase agreement. 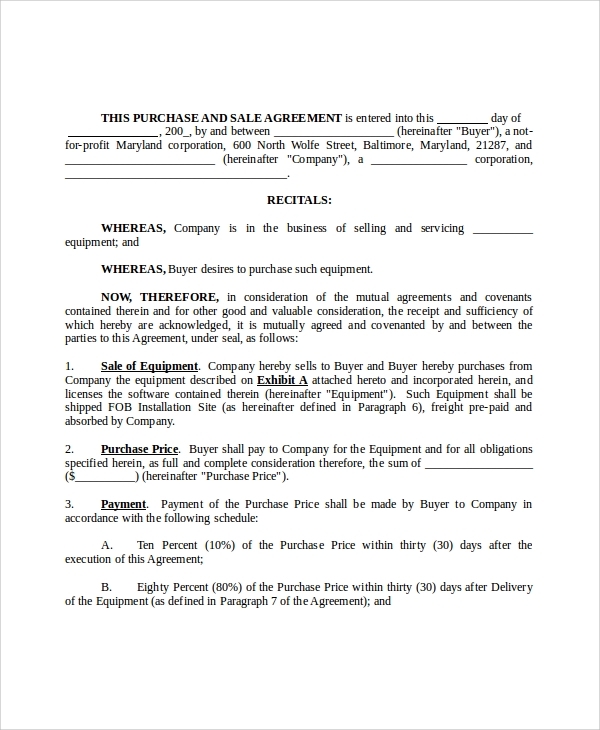 You can refer some of the best sample business purchase agreement or you may also seek for lawyers help to get it drafted in a right manner. Such type of agreement helps the owner understand the important terms of the sale. As the ownership of business is one kind of a transaction, you must get it done in writing and for which this type of agreement is necessary. You can refer to sample Business Lease Agreements for better understanding about this legal document. This type of agreement enables the party to understand what and where to negotiate, what to expect and why is it necessary to call on the accounting expertise. 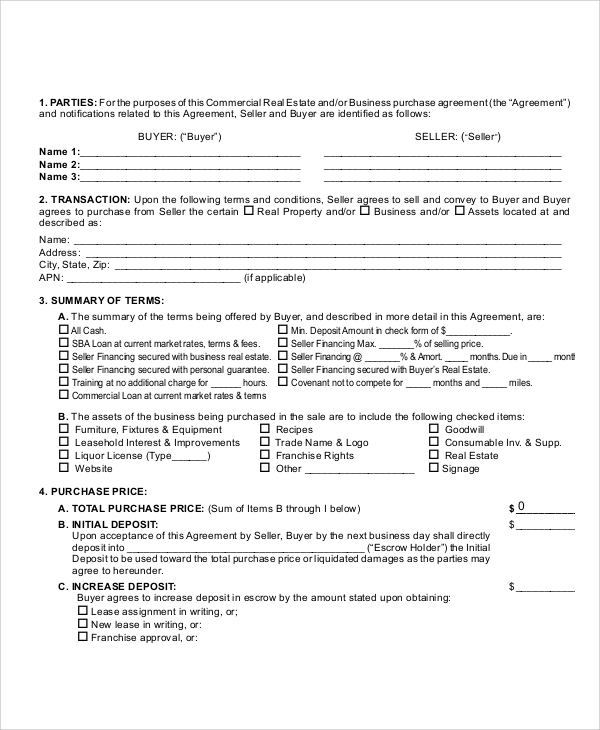 After a successful investigation is made after buyer’s purchase proposal, this agreement is the final step for a sale closing. The ideal purpose of this agreement is to protect your financial confidentiality during the purchase and sale of the business. It is also called as non-disclosure agreement in which the buyer has an authority to decide on which information should be kept completely secret. With a business purchase agreement, you get the authority to buy or sell any business type such as stores, retails, restaurants, industrial shops, and professional services. It is mostly used when you want to sell your own company name, furniture, supplies, machinery or the customer list from which you receive the accounts. Such type of agreement is also used for purchasing the real estate of some other company and make sure that the representation and warranties of the seller are enforceable. 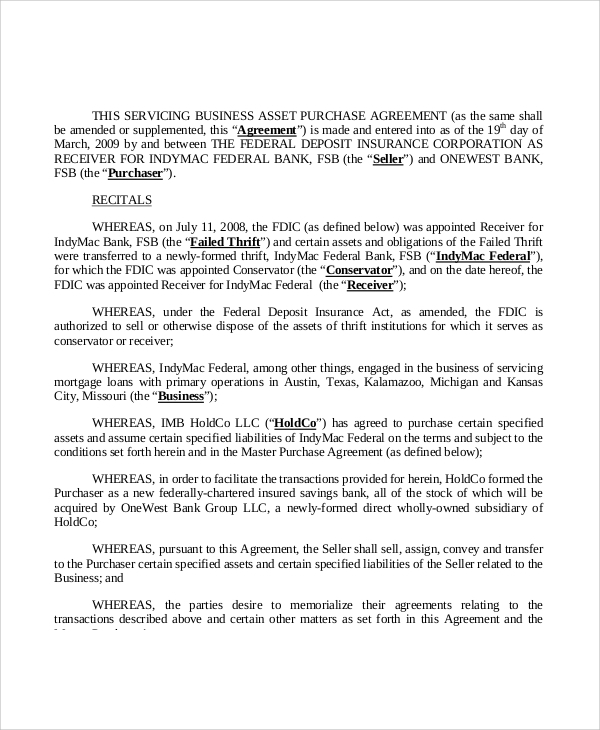 It is an agreement on which both parties needs to settle on a particular sales terms and ensure that the agreement is done in a good state of business.You can also see Residential Purchase Agreements. Who requires a Business Purchase Agreement? Whether you have a small business or a large business, if you wish to expand it or add a new sector in your business as a part of your investment then you need this agreement. It is an agreement made between the two parties who are involved in making this type of business that is the one who buys it and the one who will be selling it. This agreement has many legal terms included which you may not be aware of. That is when you may need a qualified lawyer who holds a good experience in this field. The parties who would be involved in making this agreement need to also complete a worksheet of Sale of Business Assets also known as business sale agreement as a part of this process. 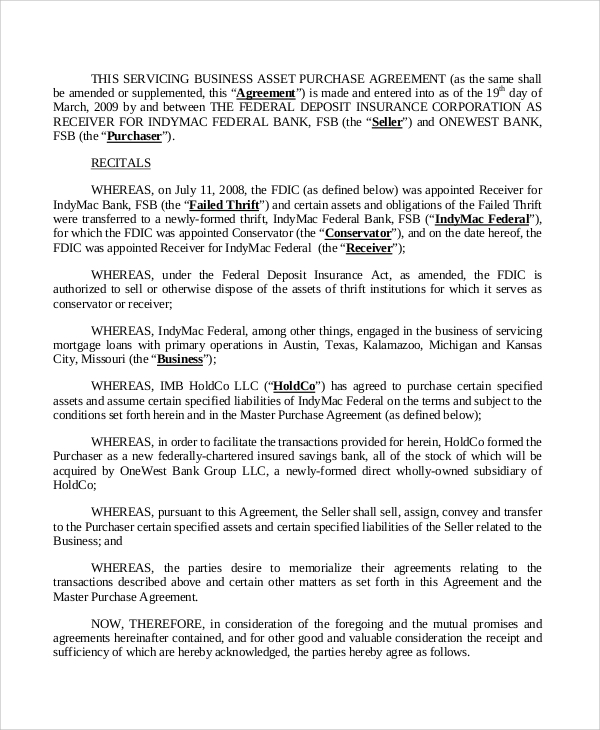 The same is applicable for the home purchase agreement. 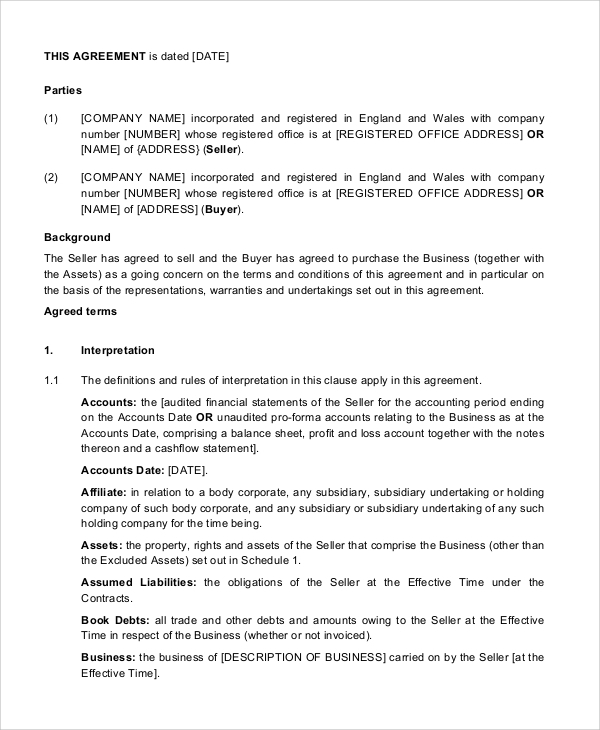 How to Create/Write a Business Purchase Agreement? There is no hard and fast rule to create a business purchase agreement but there are some important conditions and terms that you might not be aware of. 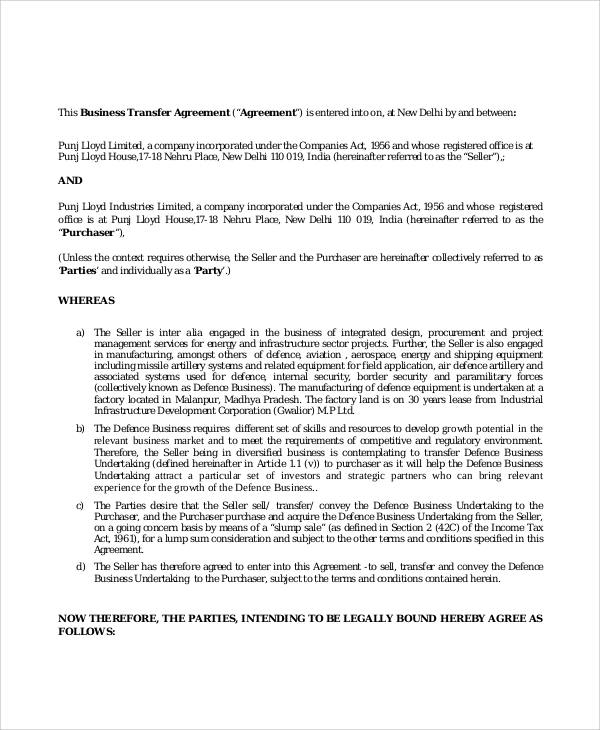 To begin with the agreement, you have mentioned the details like the name of the person who is transferring the business to the name of the who will be a new owner of it, the date of completion of the transfer, know if the existing employees will be re-hired by the new owner and also understand if the assets of the business will be transferred or not. You need to include assets, accounts receivable, disclosure, liabilities, conditions, inventory, payment terms, and termination. Business purchase agreement makes the basis of the entire transaction but you need to be sure about what is conveyed and when the conveyance will actually take place. It is more like a protection for the parties to minimize the misunderstanding that may take place during the closing process. 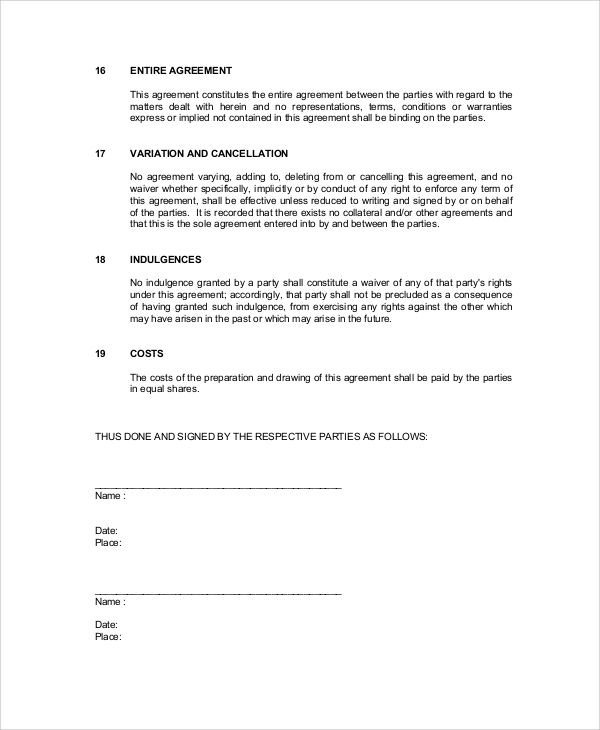 Follow the right sample Business Agreement Contract to understand how exactly the process works. You can also see Commercial Purchase Agreements.